NOTE; - Put on gloves to protect your hands. - Take care not to tear or damage the seat covers. 1. Remove the front seat (see page 20-194). 2. Remove the flex cable (A) and the cable housing (B). -1. Release the housing from the hooks (C). -2. Disconnect the cable from the worm gear (D) in the -3. Disconnect the cable from the slide motor (E). NOTE: Take care not to kink the cable. 3. Disconnect the slide motor connector (A), then remove the slide motor (B) from the slide motor bracket (C) while disconnecting the motor from the short flex cable (D). 4. 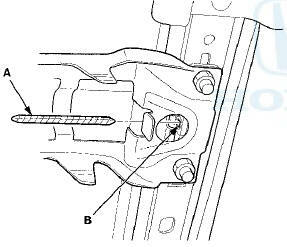 Pull out the short flex cable (A) from the worm gear (B) in the outer seat track. 5. Remove t h e m o t o r end m o u n t i n g (A) f r om the slide m o t o r (B). 6. Install the slide motor in the reverse order of removal, and note these items; - Apply multipurpose grease to the worm gear areas in both seat tracks. - Install the short flex cable to the slide motor before installing the slide motor to the slide motor bracket. - Make sure both seat tracks are all the way forward before installing the slide motor bracket on the tracks. Install the short flex cable to the slide motor. - Make sure the short flex cable and the flex cable are connected properly. - Make sure the slide motor connector is plugged in properly. -Check the front seat slide operation.